Today I want to reintroduce a program called Right Rise. It was started on 29th of October 2016 and added to AlexNews on 12th of November 2016. This is a big budget program and was launched with some very popular monitors. There are already many big investors has joined this program and joining are still going on. Let’s see what is the opportunity is being offered by Right Rise. 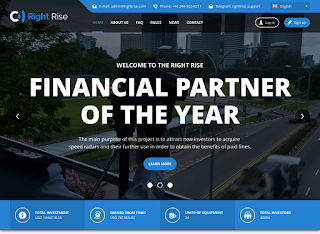 Right Rise has an attractive website and it’s little different than other traditional HYIP templates. 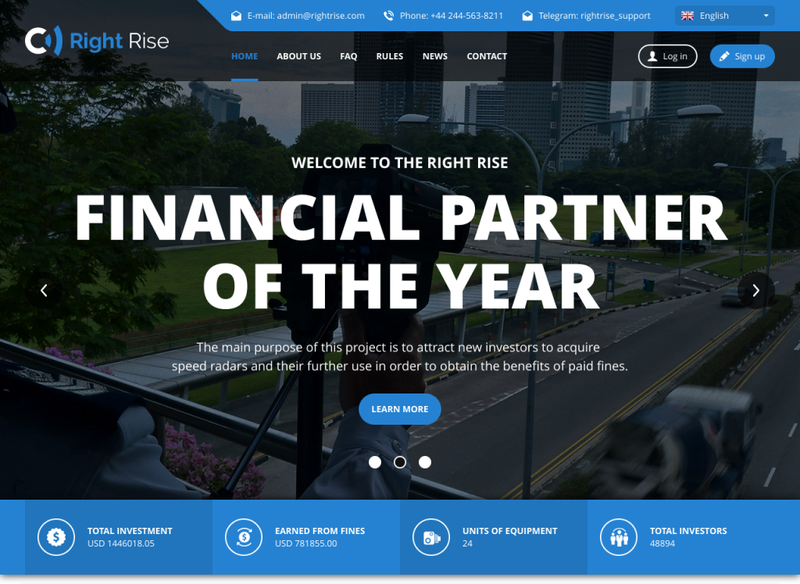 Most of program highlights their investment plans in the homepage but Right Rise has paid attention to the quality of design. By the way, investment plans are also described well at their homepage and it would be good to create a dedicated page describing their plans. Unfortunately, there are no live chat agents that you can learn more about their investment plans but they have phone numbers, support form and an unpopular messenger named “telegram” to chat live. Well, visitors will really like their webpage and it would be more impressive if they would add a video presentation also. Right Rise has a different type of investment plan. Actually it’s not an investment plan, you have to buy shares from then which cost $30 for one share and will earn 1% to 3% variable interest daily. If I write it like HYIP investment plan then it’s 1% to 3% daily for an unlimited time. Minimum deposit is $30 and there is no maximum. There is no way to withdraw the principal after a specific time. There is a booster system to boost your daily interest which required some additional tasks like bringing referrals while investing big amounts and investing daily. I don’t think boosting interest will not be an easy task for general investors. So, you have to be happy with their regular interests per day. We have seen many programs with same investment plans even my last review about XABO was offering almost same plan. The difference is here you’ll be paid for life long (not your life, it’s program’s life. Lol). Well, there is no information about average paying percent per day but from last 6 days I’ve measured that the floating interest will be around 1.5% per day. No doubt this is a long term investment plan and investing a big amount will bring a fair profit here. Fortunately, most of profit share programs live for long time specially which launched with some dependable HYIP monitors. I’ve already talked about the build quality which was quite good. Other technical specifications are also impressive. The member area is based on a custom script and it was built nicely with a clean and easily understandable interface. I can see many additional menus which were not present in common HYIP scripts. Hosting and DDoS protection is taken from CloudFlare and the website load very fast. Extended Validate SSL from COMODO which not only provide a secure connection but also give a standard look for a website. In a word, their website looks professional from the inside and outside also. Finally, there is no doubt that the admin is enough serious about their project and also I can see that they are updating their website daily with latest news and adding more features. The project is aged only 41 days and from my experience this kinds of project run for a long time. It’s somehow safe to say that this is a promising program to invest. We should keep faith on big projects and I’ll suggest you to join Right Rise if you are looking to invest in a HYIP by accepting the common risks. But, please don’t invest more than you afford to lose.